It all started one fateful evening while strolling through youtube watching woodworking videos. On the side bar I spied a video titled “make a strum stick”. 5 Videos later I started making a materials list. I spent the next few days re watching videos while spending my lunch breaks at work finding different sets of instructions from around the web. My hope was to build a unique instrument using the base plans as a guideline. This being my first instrument build I didn’t want to spend much on it in case it ended up sounding like a string on a can, but at the same time I knew I had to use hardwood to get a decent sound from it. Most of my woodworking to date has been done with soft pines and ply woods, I was looking forward to working with a hardwood. My first obstacle was buying supplies, both instrument parts and hardwood. I wanted to make sure I could get the fret wire and tuners at a reasonable cost before sinking money into some nice lumber. I shopped around online and most items were fairly cheap, but shipping was astronomical. Some sites charged $20 shipping on $26 dollars worth of parts! Then my wife suggested I call the local music store (Long and McQuade) and see if they would have any of the parts in stock. They did indeed stock the parts and at around the same price as their online competition. I gave my wife a kiss for the great suggestion and got to work collecting bits and bobs. With the musical parts collected I now needed lumber. Frustratingly here in Newfoundland we don’t have a lumber yard that sells exotic hardwood lumber so that limited me to what big box stores carry. Luckily while walking through Kent (Atlantic Canada version of Home Depot) I discovered a small rack in the back of the store that held a modest selection of exotic hardwoods. Excited by my new found discovery I started poking through the rack in hopes of finding what exotic tree would be my new instrument. Of course all the boards were dimensional lumber (1×6 = 3/4×5/12) Meaning I would have to glue 2 pieces together to get the 1”x1” blank required for my project. so instead of going for the 1×6 exotic lumber I had a look at the “craft” boards. Here I found a 1/2” x 4’ piece of maple (interesting how the cheaper craft boards aren’t dimensional) and decided I would cut it into 1” strips and glue them together.So with my maple in hand along with a $5 can of espresso stain from the “dented can” rack I headed back home to my shop. I cut my strips and started pondering about my glue up. The plans called for the growth lines in the wood to point up but the sound box is formed by dry bending. I wasn’t sure if I should follow the plans or if I should glue my 2 board side to side so each bent arm would be from a different piece. In the end I was more worried about the side to side method over time ripping in two from the stress and stacked my grain vertically. After I had the lumber glued up into a 1×1 blank I had to square it up as best I could. I ran it through the table saw and gave it a good going over with my belt sander. I would have liked to use my thickness planer, but its currently stuck in my shed behind 4ft of snow… but I made due. Blank squared I went about shaping the neck. I don’t own a band saw, so where the plans called for a band saw cut I used my scroll saw. My cuts aren’t as straight as a band saw using a guide would make but that’s what sand paper was created for! 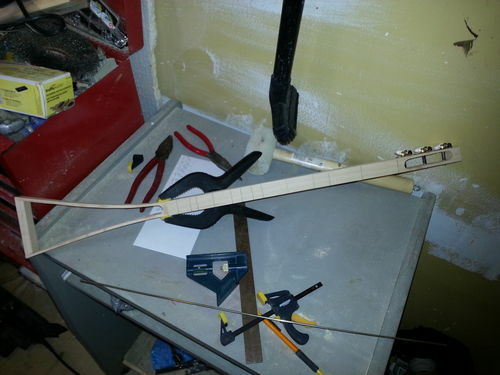 Next was to cut the slots for the fret wire. I debated using my scroll saw for this as it uses very thin blades but I didn’t think I would be able to keep the lines straight. The next thinest blade saw I own is a coping saw. A few test cuts and fits and everything looked great. I set up my miter box, measured my frets and started cutting. 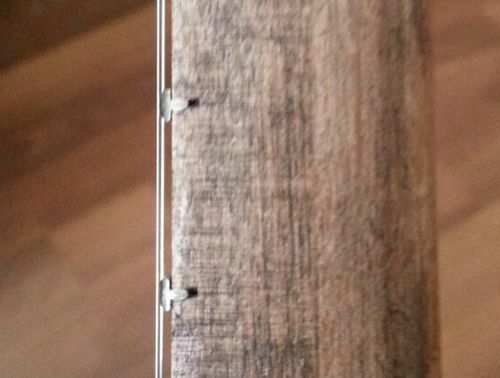 I marked the lines on my fret board within the nearest 16th based on the measurements. As for depth of cut I eyeballed it. Fret lines cut it was time to shape the bottom of the neck with a roundover bit on the router. Now as you all know testing your router profile on scrap is crucial. All too often though we get lazy and think “It’s only a roundover, not a hard cut. I don’t need to waste time running scrap through my router”. Well today was almost one of those lazy days. I had selected the 3/4 roundover bit from his storage slot and set it in my router. I was about to send my good blank through the router when good sense made me grab a piece of 2×4. Well good thing I did a test cut, because where my 3/4 roundover bit should have been was a roman oggee bit REMEMBER KIDS: Test cuts are NOT a waste of time…. EVER! After cutting, shaping, bending and sanding I had an instrument neck and part of the sound box. Next was the sound board and back. The rabbit at the bottom of my fret board was 1/8 in as per the plans, so to make life easy I would head back to Kent and get some 1/8” maple from the “craft” section. I got to Kent and no surprise the thinnest stock they carry is 1/4”... I would have to mill a 1/8” strip on my table saw. Keeping safety in mind I picked up a 1×6 x 2ft long of maple. I got home and set up my cheapo ryobi table saw, aligned the fence and set up a feather board. Using a push stick and standing well clear of the board in case of kickback I ran my first 2 passes on the board to get 1/8”. My first resaw successful I turned the board around to cut another off the back. Being an el-chepo contractor saw it’s not really built with a zero clearance insert in mind. There really isn’t even a way to easily make one that will fit int eh slot. I decided to take my chances. This time the cut never worked out so well. The board ended up falling through the slot in the table and binding up between it and the blade. As with my first cut I was well clear of the board and luckily no injuries were had that day. I retrieved my now mangled maple board from the innards of my saw only to find what had been cut was just big enough to be used as a back for my strum stick. Lucky me! I trimmed up both front and back boards, bored the sound hole on the drill press and got ready to glue it up. I had already stained the neck and body of the strum stick with espresso stain so took care not to get glue squeeze out on the stained wood. I used painters tape which as always works great. I glued and clamped the back board, it came out beautifully. I wasn’t as lucky with with the front sound board though and during the glue up / clamping the piece managed to move on me. I was devastated. I had worked very hard to try and get a nice finished product out of this instrument even if it was just a prototype. Oh well, at least I could make sure it sounded good even if it didn’t look great. Everything glued and frets installed I couldn’t wait to see what it sounded like. I installed the string strings and tuned her up. Boy was I surprised. The sound out of this small instrument is amazing. Strumming sounded great, though it seemed that 1 fret is off by a fraction. After playing with it for a while I took the strings off and hit it with a few coats of spray lacquer and gave it a light sanding with 600 grit to knock down the grain. This has been one of my most gratifying projects to date. I have always wanted to play an instrument and in fact I own a violin and viola with the hopes of learning to play them. I picked at both for a while but could never get hooked. The strum stick though is a different story. Being diatonically tuned makes it a great instrument to just pick up and play. But having an instrument I MADE makes the thing nearly impossible to put down. As a bonus it seems everybody int he house loves playing with it, even my 9 month old son! I also learned a lot of neat things behind the science of stringed instruments, that was really neat. I already bought some walnut to make my next “prettier” strum stick with. Hopefully with my lessons learned I can make another instrument I can be proud of. Though this little guy will always have a place in my heart! I must admit I skipped through your lengthy description and focused on the bottom line… Lesson learned indeed. Welcome to the wonderful world of working with the often times mysterious qualities of wood, personally I love this challenging material, and the end results are so worth it. I am sure even with some of the issues, this sounds like it is supposed to. I think anyone that is thinking of making an instrument should start with one of these, very little material at risk and gives some insight into the tolerances of building an instrument. I guarantee it will take anyone’s skills to the next level. If you are interested I had my son do a small instructional video for the folks I made strumsticks for – this may help. Very cool, i just seen some youtube videos on these recently also. Great build. Great first strum-stick! I make several instruments and learned early on that the only way to do frets is with metric rulers and yardsticks! Try it on your next one. Stewart-MacDonald, http://www.stewmac.com/FretCalculator, has fret calculators in inches or metric if you need converted. CB-Gitty, https://www.cbgitty.com/cubecart/, is the best place to buy fittings-strings-keys in North America, don’t know what his shipping is like but you could check. He’s real reasonable on everything and a great guy to deal with. Have fun, they’re really addictive!!! Nice job, I have made several of these and found the them to be Great Fun! to make and like Rich says a great learning tool for musical instruments. I purchased all tuners, fret wire, & strings from STEWMAC.COM Didn’t find the shipping to be that bad, but maybe shipping to Canada is a little more. Rich’s son has done a nice job with that video. We all learn lessons the first time and you started on something a little harder than a Cigar Box Guitar. I made a Strum Stick after making a couple CBG’s and my experience with CBG’s helped a lot. There are some tools at Stewmac.com that can really make thing easier. I made a jig to cut the frets and eventually purchased their fret cutting saw to go with it, witch was worth every penny. You can easily adjust it for depth of cut. With their depth stop. Watch out though, these things get additive and then you end up with a house full of cigar boxes! Some that I have built: http://www.cigarboxnation.com/profile/PaulDoug You have the be a little patient the strumstick is towards the end of the slide show. This is a great project. I built one last year. Good write-up! Nice. 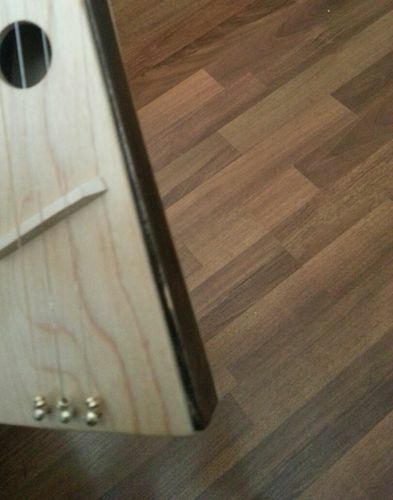 I’ve made a couple of ukuleles out of scrap materials and used bamboo (chopsticks) for the nut and bridge. Great writeup on an excellent project. ps Have a nice cold Blackhorse for me.